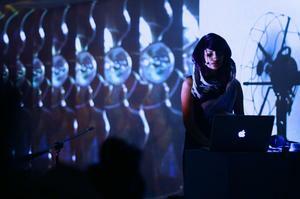 Surabhi Saraf is a media artist, composer, and performer who uses her background in experimental sound, Indian classical music, and choreography to create audio and video immersive experiences. Her collaborative work has been performed at NETMAGE 10 International Live Media Festival, Bologna, Soundwave Biennial ((5)) San Francisco, Yerba Buena Center for the Arts, Asian Art Museum (SF), and Links Hall, Chicago. Surabhi has performed solo at Currents 2011 & 2012: International New Media Festival, Santa Fe, SOMArts, San Francisco and Max Mueller Bhavan Goethe Institut, Mumbai & New Delhi, among others. Surabhi is the recipient of Eureka Fellowship Award 2015 by the Fleishhacker Foundation, the Djerassi Resident Artist award, and was nominated for the SECA Award 2012, SFMOMA. She graduated from the School of the Art Institute of Chicago in 2009 with an MFA in Art and Technology. Surabhi lives and works in San Francisco.